Checking the market capitalization of crypto currencies is working quite well for older and established coins, however when a new coin launches it can temporary move to the top places in terms of market cap and that can be misleading. So using a bit more advanced algorithm may be helpful in providing a more realistic information in terms of crypto coin popularity than just the current market capitalization alone. 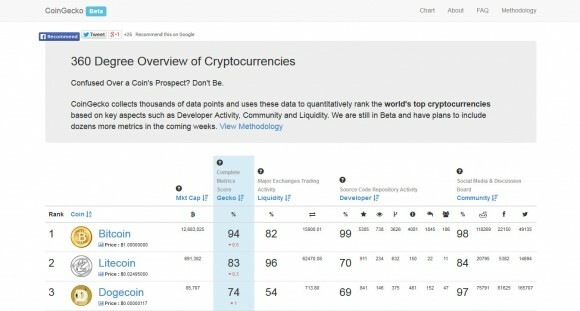 And a new service called CoinGecko was just launched that evaluates cryptocurrencies by looking at more core metrics beyond just their market capitalization. The service is still in Beta stage and currently evaluates 24 cryptocurrencies based also on their developer activity, community team and liquidity. And with just a quick look you can see that there is difference as compared to only ranking based on market capitalization. – Liquidity volume across multiple exchanges and trade pairs. – Github stars/watches/contributors/issues/forks/pulse/merged pull requests. 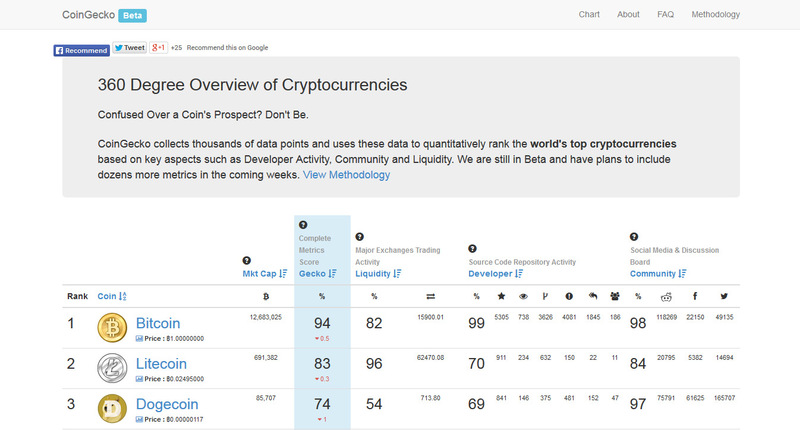 Obviously having a bigger and more active user community does play an important role for the value of a currency and for example Dogecoin may not have such a high market capitalization as Peercoin, but has a larger community around it and is ranked 3rd by CoinGecko while at the same time the market cap of DOGE secures it the 5th place. So definitely an interesting project to keep an eye on, especially with more coins being added and new interesting ones being launched.